If we’ve learned one thing from working in South America for all these years, it’s that you should always expect the unexpected… However, even by our standards we were slightly taken aback by news hitting the wires last week that Argentina’s largest private airline LAN Argentina was being thrown out of the country. On looking into it, we found that they weren’t actually being thrown out, the goverment had just told them that they could only use their hangar at Buenos Aires’ domestic airport, Aeroparque Jorge Newberry, for another 10 days before it would be taken from them… Now, you don’t have to be an aviation expert to realise that it’s quite difficult to run an airline, clean and repair your planes, and all those other things which you’d hope an airline would do, if you don’t have a building to work in. The government effectively owns the airport concerned – although LAN only recently entirely refitted the hangar at a cost of around US$5 million – and in theory they can run it as they see fit but, particularly given the ridiculously short notice, it effectively shuts down LAN Argentina. Why would anyone want to do that, you ask? Well… as well as effectively owning Aeroparque airport, guess who owns LAN’s main competitor for domestic flights in Argentina? That’s right, the venerable Aerolineas Argentinas are also owned by the government, and although we actually think they’re fairly decent, it can’t be denied that LAN have been providing them with increasingly stiff competition. In fact an undercover video surfaced on Tuesday in which the President of Aerolineas appears to claim that he has asked President Cristina Kirchner to deny LAN permission to fly on several routes because Aerolineas were struggling to compete. 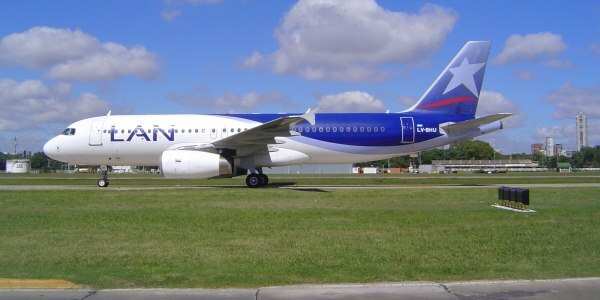 There have been rumours to that effect for years as LAN have sought to expand their network of flights in Argentina in vain, and had prized routes (such as Buenos Aires-Iguazu Falls) taken away from them, so this video is further grist to that particular mill.